It used to be that I would slave away in the kitchen before, during, and even after any kind of big holiday meal. But not anymore! I am over it and am so much better now about simplifying so I can spend more time with those I love. So that comes to the meals I prepare for my family including for the holidays …and dare I say it, but I am even trying to get my holiday shopping done before December GASP! Yeahhh, we’ll see, but that’s my goal. I want no last minute craziness is the thing. 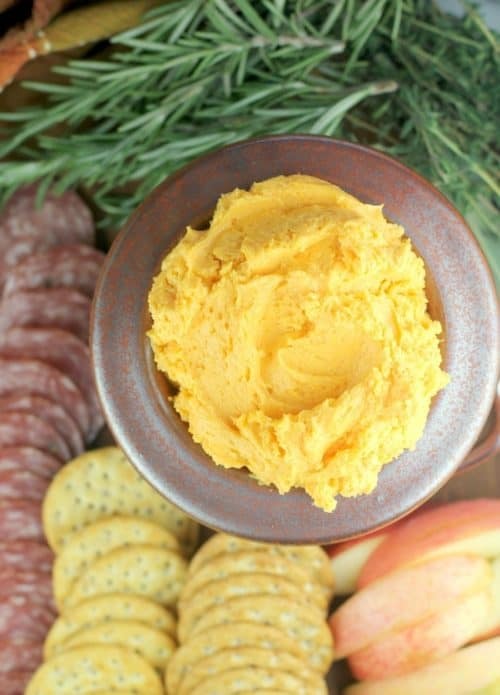 So in this post, I am working with Kaukauna® cheese. 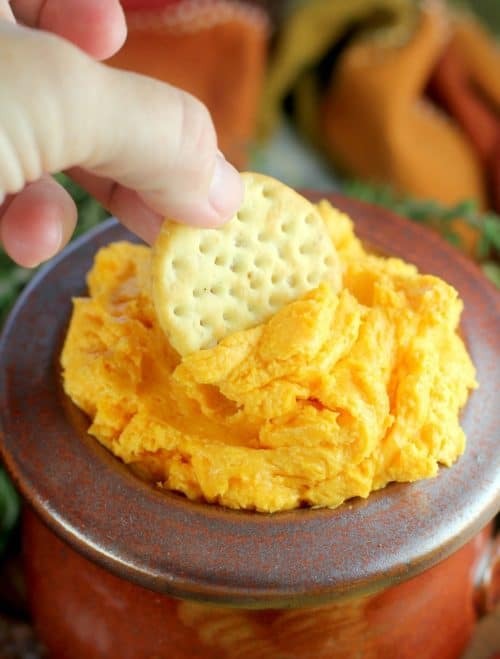 Kaukauna® is 100% cheddar cheese and comes in cups, logs, and balls, and the great thing about it is you can serve it up straight on crackers or use it in recipes like my Bacon Cheddar Jalapenos. 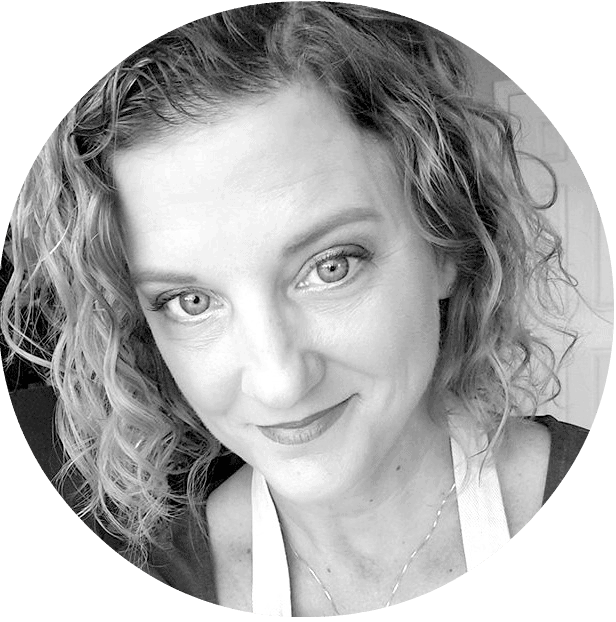 This isn’t the first time I’ve used it – in fact, THE biggest recipe on my blog here has it, my infamous Garlic, Bacon, and Beer Macaroni and Cheese. So, my love for this cheese is real. 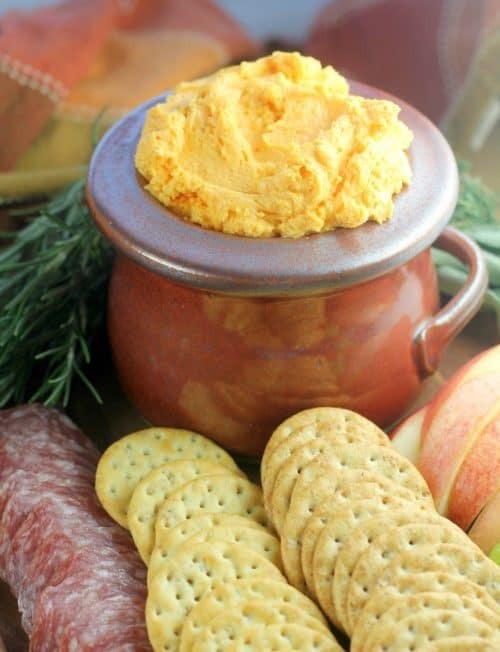 My trick with this charcuterie-ish spread here is first the Kaukauna® cheese. 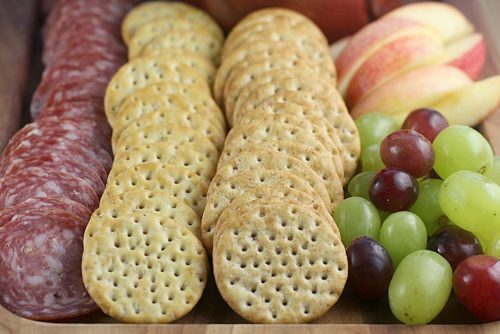 I am from New England, we have cheese and crackers …always. By serving Kaukauna® though, I don’t have to cut anything up. Literally put it out with assorted crackers and be done. Then I served grapes to have something sweet and fresh, and sliced sopressata (which I bought already sliced) because it’s yummy. Super simple, yes? But THEN, I did want to have my wow bite – the one that people would scoff right up and ask for the recipe – and you can never go wrong with stuffed jalapenos. So, the day before, I prep my jalapenos. 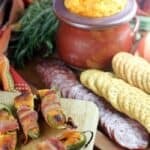 Then this recipe is so simple – use a Kaukauna® Bacon Jalapeno cheese ball, because it already has all the ingredients you need for flavor, add some jack cheese and breadcrumbs for structure, stuff the jalapenos, wrap in bacon and bake. This way, in addition to all the very simple things we basically just threw on a board, we have that one nibble that took just a touch more effort (but not too much) to make everyone feel special. 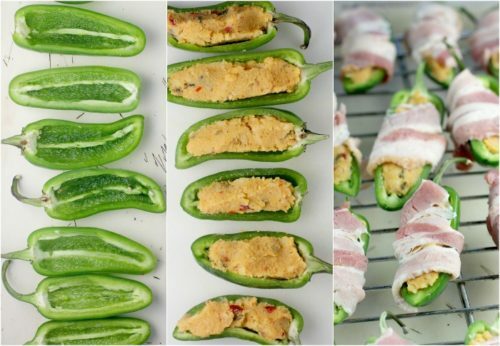 Let’s take stress from the holidays by simplifying with this table spread of assorted nibbles and the easiest stuffed Bacon Cheddar Jalapenos ever. 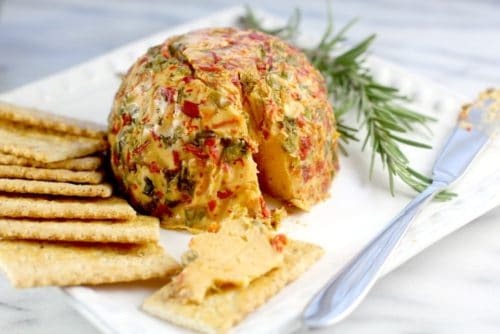 For the jalapenos, combine the Kaukauna® Bacon Jalapeno Cheese Ball, jack cheese, and breadcrumbs. Stuff the cheese filling into the jalapenos. 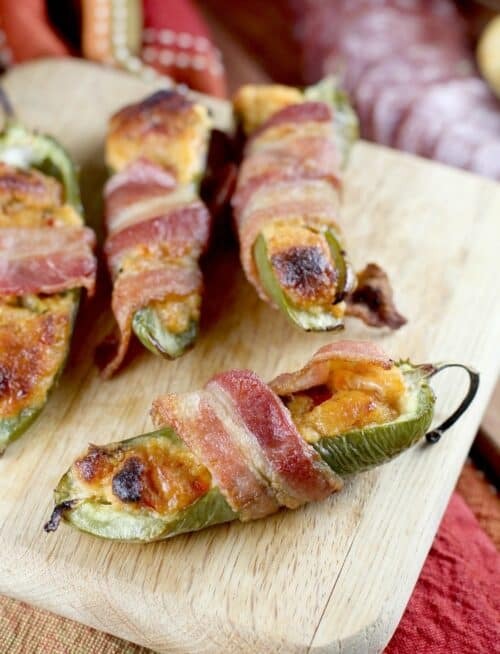 Wrap each jalapeno in bacon. Bake at 400F for 15-20 minutes until the bacon is just crisp. Take care not to overcook because the cheese filling will burn. For more entertaining ideas visit the social hub here, and for more information about Kaukauna® visit their site here. 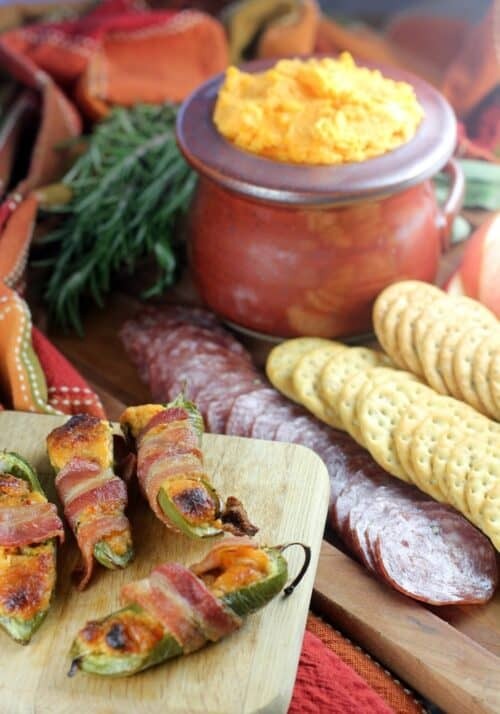 Let’s take stress from the holidays by simplifying with this table spread of assorted nibbles, Kaukauna® cheese, and the easiest stuffed Bacon Cheese Jalapenos ever. This looks too good too eat. I love that cheese dip. You had me at bacon and cheddar! 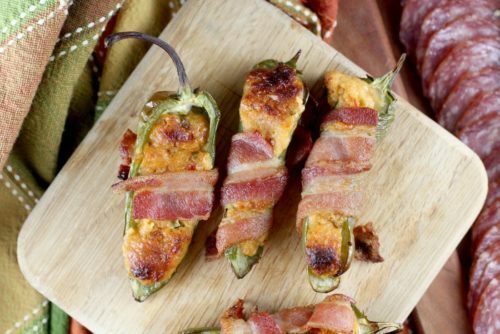 My hubby would also love the jalapeno part of this appetizer! My husband would love those cheddar jalapenos.